Are you constantly losing the things you need every day? Are you running around looking for the essentials? You need a place to hold all of the things you need every day in a convenient place that’s organized. You need to read this plan on How to Create a Family Command Center that works for you sponsored by Best Buy. Before having kids, I used to fancy myself as super organized. Type A even with how well I knew how to organize things and keep them that way. There was a place for everything. These days our system for organization seems to be ever evolving, but having a family command center has been key to ensuring we have and know where all of the things we each need daily are in a place that we can always find. 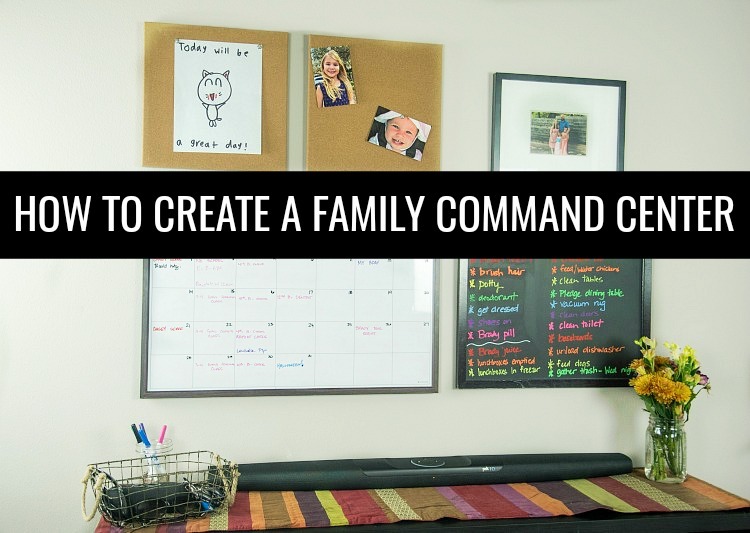 Here’s How to Create a Family Command Center plus some ideas and inspiration to get you started on your own! Everything family command center needs to be located in a central location that you spend a lot of time. Don’t put it in an out of the way nook, this has to be in a spot where you are regularly at and that may get overrun with clutter without it. Our family command center is located in our combination living room/kitchen that is right next to our garage door. We spend tons of time in this area and have to walk past our family command center countless times each day. A dry erase calendar or even a wall calendar is critical for your family command center. Having a way to keep track of your family’s schedule and important dates is so important in ensuring nothing is overlooked. Our family uses a dry erase calendar and different colored dry erase markers to ensure each event stands out. And also that each event has its own color for fast and easy viewing. You can also use your dry erase calendar for meal planning and special reminders. 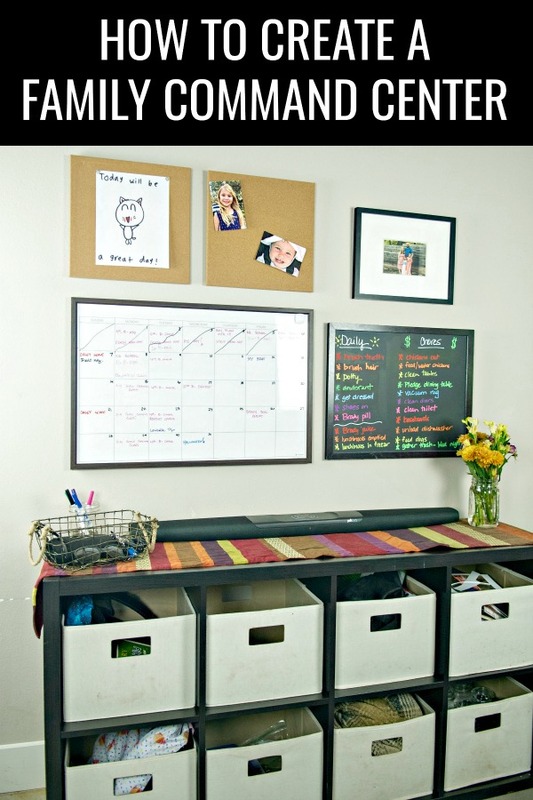 Your kids need a place to keep themselves organized on an on track in your family command center too. Allowing them to each have their own storage bin for their backpacks, lunchboxes, library books, etc. helps them feel independent and confident. And they each have a small bulletin board to display their art, photos, or things that they’re proud of! We also keep a chalkboard that I’ve written on with colorful chalk markers with their before and after school routine as well as a list of chores to keep them on track. I find myself giving out fewer reminders because they can see what they need to do and just do it. Having a place for everything is such an important feature of a family command center. Not only do the kids have their own storage bins, but I use the other bins for things like reusable grocery bags, blankets, and even my own work stuff. Knowing that everything has its place and can consistently be found is so important in making your family command center work for you. We also have smaller spaces on top like a wire bin for my husband and me to keep important items we need regularly. Having a place to store your keys, sunglasses, work badges, etc. helps us to reduce any possibility we don’t know where the essentials are. It’s also a great place to keep your kids’ allowance money because when it’s located next to their chore chart they have a visual reminder that they’ll earn money when doing chores. Go beyond having a digital assistant and add a Polk Command Bar to your family command center. You’ll get the versatility you’re looking for plus so much more because it comes with so many built-in features to enhance your home life. Performance-tuned driver array, wireless subwoofer and Dolby/DTS surround sound decoding: Offer an immersive, room-filling home theater experience. Sleek appearance: Fits seamlessly along most HDTVs for a streamlined look. What are your must-have items to create a family command center? For more posts on organizing your house and life, check these out! Pin this post on How to Create a Family Command Center for later!